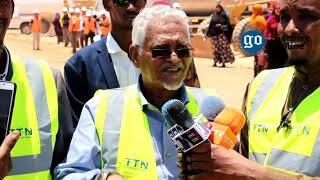 Somalia: Political leaders, their entourage and the depletion of the country’s resources. Shortly before taking office, former US Secretary of State, Colin Powell, received a letter from George Kennan, Dean of the diplomatic corps, advising him against following the tradition of his predecessors whom he claimed had "seriously misused and distorted" the office of Secretary of State through their travel. He argued that travelling should be done by “lower-level officials, especially ambassadors, while the Secretary remains in Washington”. Some of the foreign travels of Somali President, Hassan Sheikh Mohamud and his predecessor, Sheikh Sharif Sheikh Ahmed, have come under increased scrutiny as their frequent flying has come to been seen as costly tourism and, with the exception of a few trips, unnecessary. Politics in Somalia are idiosyncratic, diverse and sometimes contradictory with international political influence in the country’s affairs. Although Somalia currently has a national federal government, there is no unified vision or consensus amongst Somalis and between regional states. The African Union peacekeeping forces to Somalia (AMISOM) keeps very little peace, given the ongoing internal political and security conflicts, and contributes to the sense of loss of sovereignty. The international community, meanwhile, carries out its operations and monitoring of Somalia from neighboring countries like Kenya, Ethiopia or Djibouti, also due to security concerns. Many things have changed in Somalia over the last two decades since the collapse of central government and Somalia has taken some meaningful and significant steps forward; but the general security and conditions for institution-building remain volatile. Despite the security concerns and dire financial situation of the country, Somali leaders continue to travel constantly outside the country on official business spending millions of dollars the government cannot afford. While it is legitimate for leaders of a country to attend important meetings where issues of national interest are addressed; what has attracted the attention of the public, as well as foreign governments and aid agencies, is an excesses of travelling for trivial reasons. It is reported that since 2013, the Somali President, Hassan Sheikh Mohamud, has made 61 foreign trips that have cost the nation around $8 million. The President and his supporters will spin these 198 days outside the county as a selfless sacrifice on the part of the president to build international relations that will strengthen the function of government. One can also argue, however, that the absence of executive leadership hurts the development and, in the case of Somalia, the rebuilding and healing of the country. 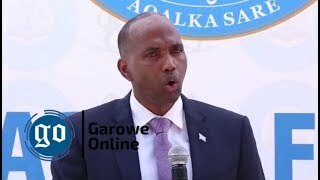 The Somali leader’s frequent excursions have cost the Somali people, as expenditures to cover travel deplete funds allocated for the country’s development. Leaders do not travel light; they bring with them their entourage, which is expensive and questionable. Hassan Sheikh Mohamud and his delegation to the 2013 London Conference on Somalia cost the British taxpayers £50,000, something that attracted heavy criticism for the British government, particularly from the right wing press. This was an exception, however, as most of the Somali leaders’ foreign travels are paid from State funds allocated for other purposes. 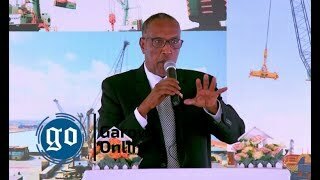 In this age of uncertainty, the Somali government and its political leaders need to face reality and give a more serious look at the cost of reconstructing the country while coming up with a strategic direction which gives hope to the Somali people. 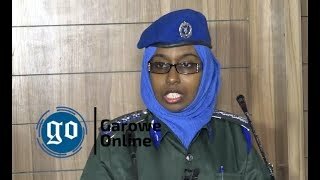 The first duty of government is to ensure the protection, security and well-being of its citizens and, in the case of Somalia, to provide political stability. Somalia is in a precarious situation due to the absence of central authority and its prolonged internal conflict. Somalia faces more danger and risk than most countries in the world, in terms of security, poverty, famine, and drought. Since 1991, it is reported that the country has suffered close to 1.5 million deaths related to conflict and famine. Nearly 2.5 million people have been driven out of their homes, displaced internally or to neighbouring countries as refugees. Somalia is one of the poorest countries in the world and subsists on international donations and remittances from the Diaspora. It has a large burden of the debt accumulated through loans from the IMF and World Bank over the years. Given this grim scenario, it is inconceivable for the country’s leaders to constantly travel to foreign countries and spend Somalia’s meagre resources. Not only do these travels deplete resources, often Somali leaders are accompanied by large self-important entourages that contribute nothing of value to the trips. While foreign travel is essential for various reasons, world leaders travel only when the trip benefits their country through improved business connections or the development and maintenance of mutual relationships. Unfortunately, the purpose, significance and rationale behind many of the Somali leaders' trips are not clear. Somali politicians appear to lack both the urgency and the understanding of the country’s situation. While the leaders are away on frequent foreign travel the country’s crisis only deepens. There is a pressing need for a renewal of political will in Somalia and diplomatic efforts to tackle the serious contributing factors to the crisis. The national interest for the Somalia government, whether it is federal or regional, lies in bringing together all institutions to work towards building political stability and social cohesion in the country. That being said, a recent United State visit both by the President and Prime Minister of Somalia baffled me and brought me to write this piece. The reason for my concern: the large number of people meeting the leaders, both as well-wishers and as opportunity seekers. 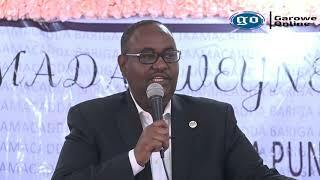 It appeared as if these visitors took up every minute of the leaders’ time and one needs to ask, therefore, when would they find space to speak with the leaders of the country they were visiting about the progress and interests of Somalia? This culture of nepotism and assumed entitlement seems to be socially acceptable at both regional and national levels, with the leaders perpetuating it for their own purposes. 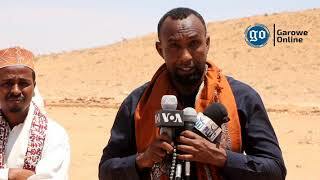 Somali clan politics can be treacherous and extremely frustrating for those in politics and for the ones who do not understand how the country’s political structure intertwines with clan structure and the way these relationships are maintained and at times manipulated. One can argue that the behavior by Somali leaders and their groupings are the legacy of colonial dependence and the abusive and manipulative politics of the military junta. Somalia also has a culture of social dependence where families extend families and even neighbours are interdependent with each other; as the saying goes: ‘it takes a village to raise a child’. While this behavior is common in Africa; there must be a distinction between family and community reliance, and mismanagement at the political and professional level. The behavior of Somali leaders and their entourages should not be accepted as a cultural norm, but as a shameful and wasteful practice, costing the country its future. Whether Somali politicians are aware of it or not, their actions have an impact on the country’s development. The international community’s funds, pledged in London and Brussels, to support Somali authorities with the country’s capacity building are rumored to have been depleted before any tangible development has been done in any part of Somalia. It is said that more than 80% of the New Deal funds ($2.5 billion) is already used up. I am not surprised because some of theses expenditures have gone to the frequent travellers with their associated costs. A poor country like Somalia needs leaders who are more eager to lift the country out of poverty and disarray than to act as kings who have resources to waste. One of the most important tasks facing current Somali leadership, federal or regional, is to identify the country’s fundamental values and to find ways work towards their achievement. The government needs to engage with the international community for the advancement of peace and stability in Somalia and to bring greater focus on their efforts inside the country. In this way, the cost of traveling abroad will lessen and much-needed resources will be saved for development. The government needs to develop a vision for job creation and for the rebuilding of public institutions. Public servants need to frame their work and their contributions as patriotic duty rather than as a means of acquiring wealth. The prolonged absence of the political leaders on foreign visits and the corollary waste of resources on airfares and hotels is a problem that needs to be dealt with by both the leaders concerned and the nation. A systematic review of governance and cultural influence is crucial to development of sustainable democratic and social growth. Critical thinking across Somali society and the involvement of government agencies and political elites in this reflection is essential. Somalia requires a government that is grounded in the country and which pays attention to the needs of the country. Well-planned efforts from all levels of governments will bring with it increased confidence and will ultimately benefit Somalia as a whole. The government must produce a full strategy for clear decision-making about the country’s priorities and the capacities and resources required. It should focus less on overseas excursions and more on cost efficiency. Presidents and the Prime Minister should focus their energies on Somalia itself and should delegate to their junior ministers and ambassadors the task of managing foreign affairs - except in those cases where it is absolutely necessary.